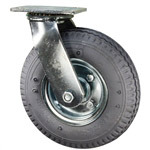 Casters with pneumatic and semi-pneumatic wheels provide exceptionally quiet and easy rolling performance for many applications; such as carts, dollies, and shop equipment. 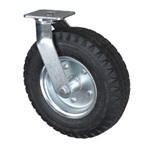 Semi-pneumatic wheels will provide a tougher, more durable flat free option with higher weight capacity, but there is a slight reduction in vibration protection. 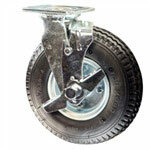 Various tread designs are available for interior or exterior environs. 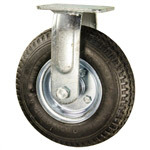 Examples of applications and environments in which pneumatic wheels can be used are hospital and medical, entertainment industry, electronic equipment, and hotel-motel carts. 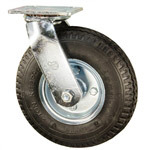 Wheelbarrows and hand trucks are mostly fitted with models from this category. 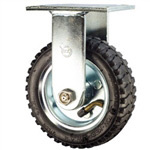 Common wheel sizes range from 6" to 12". 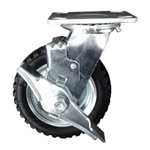 For models not shown online or for more options, please call our facility in West Reading, PA at 1-800-215-8220 for current prices and availability. 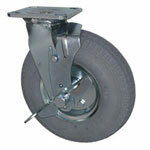 Top plate size: 4-1/2" x 6-1/4"
6" diameter by 2" flat free wheel. 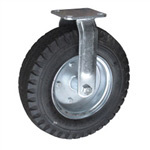 Top plate size: 4" x 4-1/2". 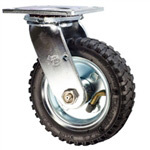 300 pounds capacity per caster. 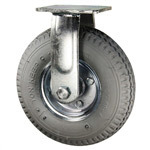 Top plate size: 4-1/2" x 6-1/4".